Liquidating? Downsizing? Need money? 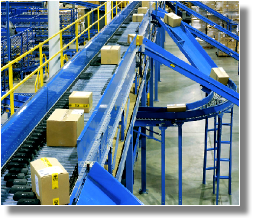 Cleaning out your warehouse? Let us help you. 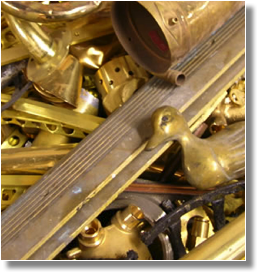 We often buy entire inventories and a variety of warehouse items! 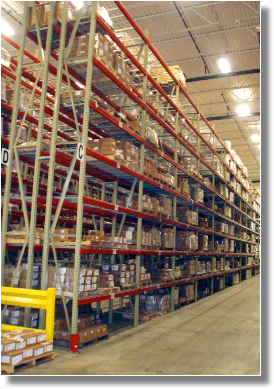 Sometimes you end up with pallet rack systems, or various components that you simply don't need anymore. Of course they are valuable . . . but to whom? And an auction will often result in a major loss. That's where we come in! We're always looking for product to purchase. 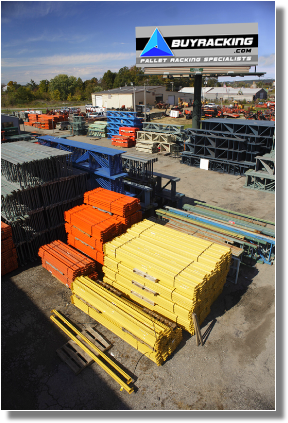 We buy and sell brands such as keystone, Ridg-u-rack, slide-n-lock, structural, sturdi-built, t-bolt, and teardrop. Call us and tell us what you have . . . send us a few pictures, and we can probably make you an offer right then. 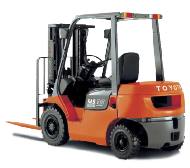 And also remember, we are often in the market to buy other warehouse assets or equipment. It cost nothing to talk . . . so give us a call. 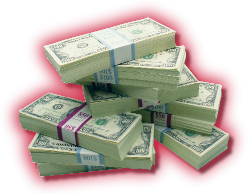 Getting quick cash for your unwanted scrap is actually quite simple! 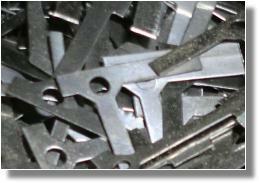 First, call us so we can ask you a few short and simple questions about your scrap. 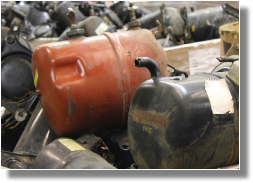 Getting an estimate from us for your scrap, has never been easier. Selling your scap has never been easier. First . . . give us a call and tell us what you've got. Second . . . we'll probably ask you to take some photos of those items and then e-mail those photos to us As they say, "a picture is worth a thousand words". Third . . . we'll tell you which items we have an interest in and what we'd be willing to pay. 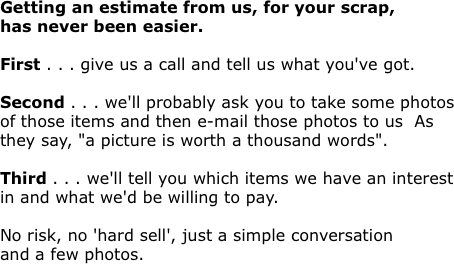 No risk, no 'hard sell', just a simple conversation and a few photos. 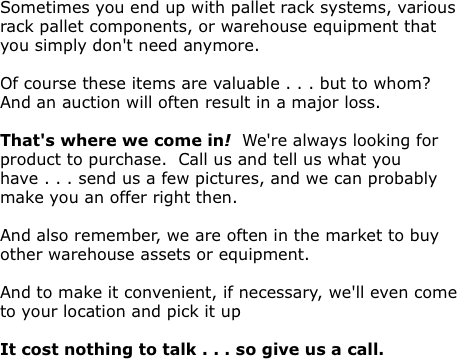 When you want to sell, you can either deliver, or we'll come and pick it up! It's your choice. 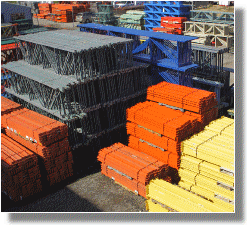 We often buy, trade, barter, or consign: shelving, conveyors (gravity with or without legs), mezzanine, rack repair, tool cribbing, uprights, beams, wire decks, carts, warehouse assets, and other warehouse equipment Turn your inventory ''GRAVEYARD" into cold, hard cash! When you walk around your facility take note of those dark corners packed full of outdated or unused equipment. 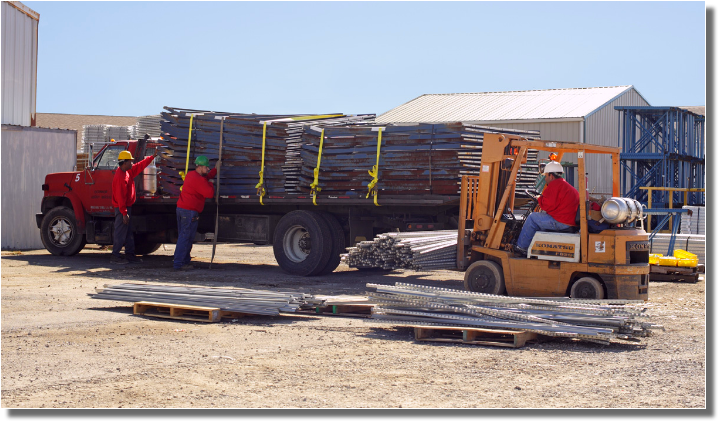 Do you have any of those rented trailers that have been parked "out back" for who-knows how long! What's inside them? 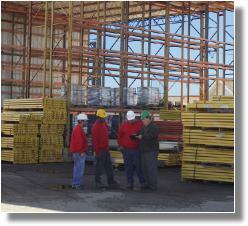 We buy brands such as keystone, Ridg-u-rack, slide-n-lock, structural, sturdi-built, t-bolt, teardrop, and others. Call us. We may want to buy it! 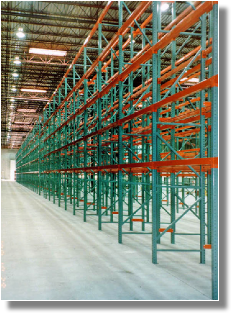 "We buy, sell, trade, and service pallet racking." 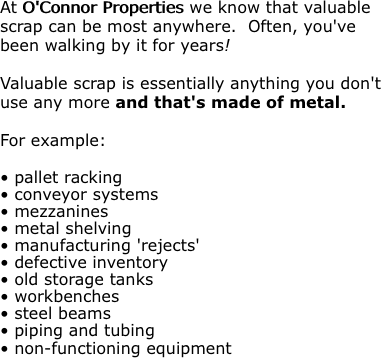 All sales and services provided by O'Connor Properties, Inc.
Don't forget - At Industrial Installers, we are also pallet racking specialist, and we have in the past 'traded' our pallet racking services for your scrap, or your excess/damaged racking. 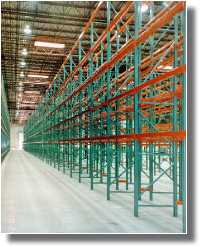 So if you need racking moved,modified, reconfigured, mezzanines added or moved, or most any 'rack-related' services, give us a call and let's talk!